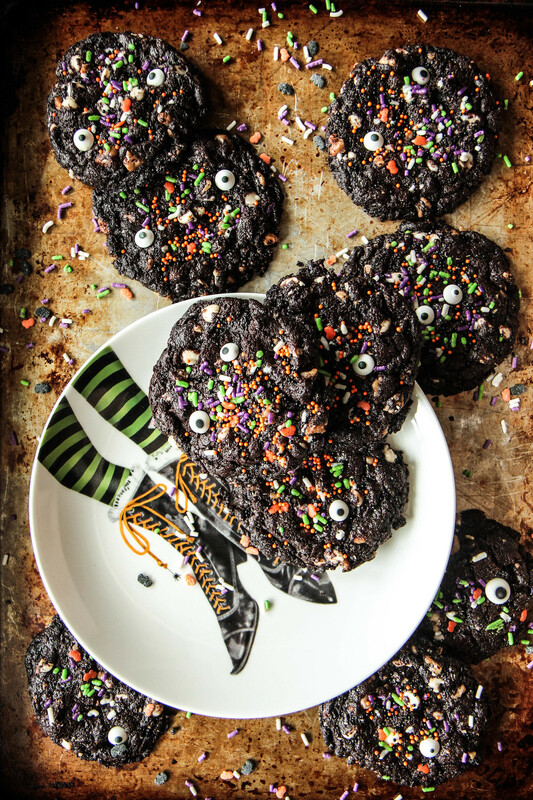 I am so excited to share one more Halloweeny recipe with you! 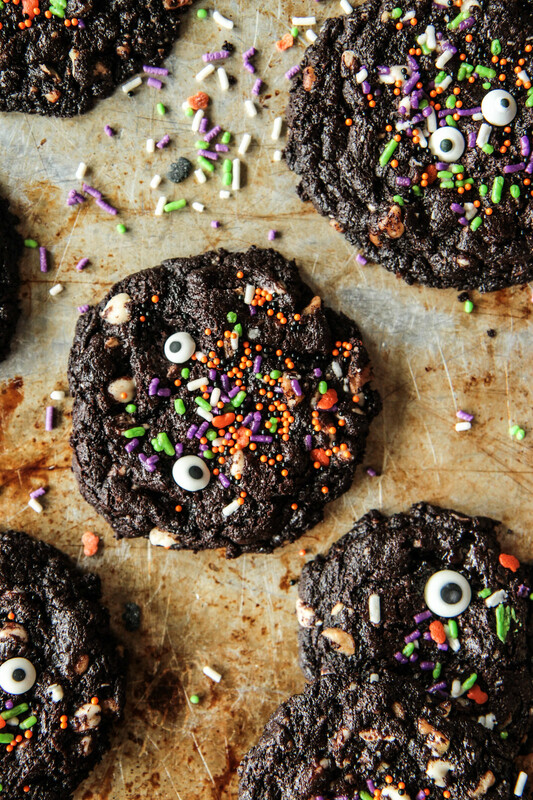 These Flourless Dark Chocolate Walnut Monster Cookies are so fun and completely delicious. Not to mention dark and chocolatey and naturally gluten-free since you don’t even add flour of any kind- JUST cocoa powder! I love that the lack of flour also keeps them really delicate and with a great blend of crispy and chewy. We have a secret ingredient that also happens to keep these cookies vegan- instead of egg whites, we are using canned black bean liquid!! I know it sounds absolutely crazy but I swear it works and you don’t taste anything but delicious chocolate. I love that we added walnuts and white chocolate to make them extra lumpy and weird: perfect for portraying monsters! 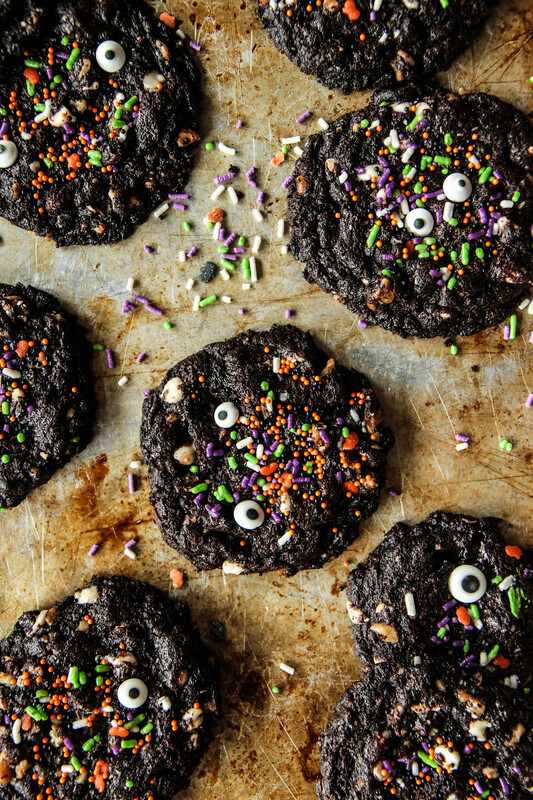 The Halloween sprinkles are something fun and extra, but of course you could make these any time of year. To see Pia and I make these live, hop on over to Instagram and check out my Insta-Story highlight real! Feel free to drop any questions in the comments or DM me! Preheat the oven to 350 degrees and set up two sheet pans with silpats or parchment paper. In the bowl of a standing mixer with a whisk attachment, add the vegan butter, coconut oil, brown sugar, white sugar and vanilla and combine well. Add the black bean liquid and combine until all the way mixed in. Add the dry ingredients and mix until you have cookie dough. Briefly mix in the walnuts and white chocolate chips until just combined. Ideally, refrigerate for about 30 minutes so that the batter stiffens up a bit. Scoop the dough out in rounded spoonfuls onto the prepared sheetpans, keeping in mind that they will spread quite a bit. Add the sprinkles to the top and bake the cookies for 12 minutes. Right when they come out add the eyeballs and let them cool. Serve immediately or store in the freezer! Well, aren’t these the most adorable monsters ever! How much cocnut oil do we use? Were making these this morning and just noticed it’s not on the ingredients! Lauren, I am so sorry. It was meant to be just one cup total. One cup vegan butter or coconut oil, or half of each. My sincere apologies- I went in and fixed the typo.